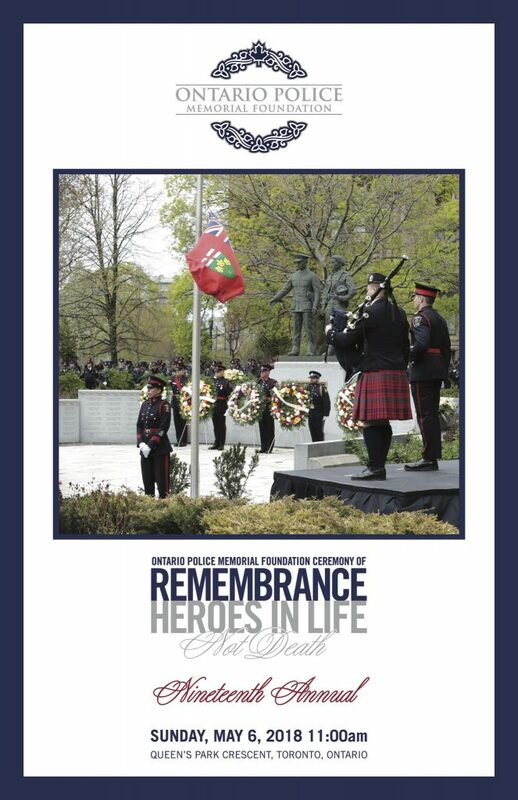 All welcome to attend Ontario Police Memorial Foundation Ceremony of Remembrance in downtown Toronto, Ontario Canada Sunday May 6, 2018 11am. All 266 names will be read aloud beginning at 10am, by two recruits representing the latest graduating class of Ontario’s finest from the Ontario Police College. Music from the Waterloo Regional Brass Band and songs from members of the Ontario Police Choruses will be performed prior to the arrival of the Procession of Honour. Attending the Ceremony will be the Honourable Elizabeth Dowdeswell, Lieutenant Governor of Ontario; the Honourable Kathleen Wynne, Premier of Ontario; the Honourable Marie-France Lalonde the Minister of Community Safety and Correctional Services of Ontario; and the families and friends of the fallen officers. The architectural illumination of the CN Tower will be done in blue light the evening of May 5th to honour police officers in the Province of Ontario who have lost their lives in the line of duty. The Ontario Police Memorial Foundation will be streaming live at http://ceremonyofremembrance.ca/live throughout the Ceremony. -The Memorial is located in a small park adjacent to the Ontario Legislature, at the corner of Grosvenor Street and Queen’s Park Crescent. -The Memorial was built from a grant provided by the Ontario Government. Official dedication Service May 7th, 2000. -The Memorial consists of two bronze statues, (approximate 2.5 m), depicting a male officer in duty dress circa 1950-1990 and a female officer in modern duty dress. -The statues are mounted atop a large granite pedestal base (weighing 30,000 lbs). At the feet of the statues are eight (8) cascading granite walls. The four – (4) walls on either side of the main pedestal form a horseshoe shape. The names of all known fallen officers are inscribed on these walls, the “Wall of Honour”. -Toronto based artist; Mr. Siggy Puchta is the sculptor of the bronze statues. He has many awards and accomplishments (1986 he designed the trophy depicting the Calgary Saddledome for the Calgary Cup Games (pre-Olympic games). In 1991, he was commissioned to create seven large Canada Geese for the Blue Water Bridge Authority in Sarnia, Ontario. In 1994, he designed the Marilyn Bell award sculpture). -The deceased member must have been a sworn member of a police service. -The Death must have occurred as a result of a traumatic event influenced by an external agent. leading to the death must have been brought about because of the deceased’s official status. -The deceased must have acted in good faith in doing everything that could reasonably have been expected. -Notwithstanding all of the above, the Committee may consider any set of circumstances which lead to a death of a member of a police service. -266 Officers from Ontario Police Services are named on the Wall of Honour. -68 Ontario Police Services are named on the Wall of Honour. -The Ontario Provincial Police have 87 officers named on the Wall of Honour. -The Toronto Police have 41 officers named on the Wall of Honour.